T he mango is a stone fruit produced by trees belonging to the genus Mangifera in the cfashew family Anacardiaceae. This genus contains around 70 species and around 25-30 of them are cultivated for their fleshy fruits. The most well-known species is Mangifera indica, renowned for its sweet fruit. One example of a species that instead bear astringent fruit is Mangifera foetida, which is normally eaten pickled. Mangifera is native to Asia. The centre of diversity is subtropical and tropical South Asia and South-East Asia. In addition to the 70 or so species, there are over 500 known varieties of mango. 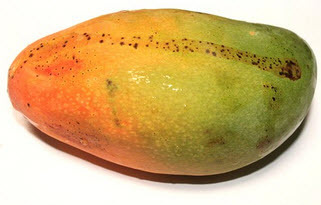 The word mango comes from the Malayalam word māṅṅa (or mangga). It is believed to have entered the English language not directly from Malayalam but rather from Portuguese, where the fruit is called manga, when Portuguese ships were heavily involved in the South India – Europe spice trade. Over 500 mango varieties have been identified, of varying sizes, shapes, colors, sweetness, acidity, texture, etc. A majority of them ripen roughly five months after the flowering. Some variants are capable of giving two crops a year instead of just one. 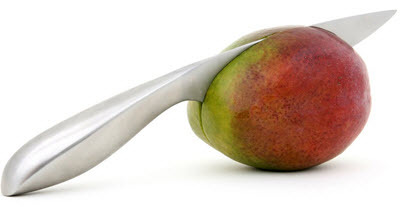 The most common mango colors are yellow, orange, red and green, but other colors – such as purple – also exist. Many fruits will display several colors and shades, and blushing is common. The skin is leather-like, smooth and waxy. The ripe pulp is yellow. The texture varies across cultivars, from buttery avocado or overripe plum to firm like a cantaloupe or very fibrous. When it comes to shape, mangoes are oval, kidney-shaped or more or less round. The smallest ones are just 5 cm or so when ripe, while others exceed 25 cm and may weigh up to 2 kg. Pit. 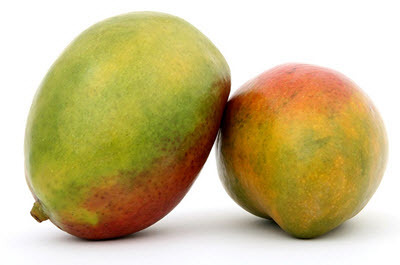 The mango contains a single pit, which is flat and oblong. Separating the pit from the pulp is not easy. A single elongated seed is hidden inside the pit. Mangifera tress can grow very old and there are examples of individual trees that are over 300 years old and still producing fruit. The tallest mangifera trees are around 40 meters and the crown radius rarely exceeds 10 meters. The leaves are evergreen. They are simple and grow alternate, with a length varying from 15 cm to 35 cm and a broadness in the 5 cm – 15 cm span. The tree has a taproot, from which a profuse spread of anchor roots and feeder roots extend. If the soil is deep enough, a taproot going 6 meters down or more can form. The flowers are produced in terminal panicles 10-40 cm long. Each individual flower is small and with five petals no longer than 1 cm. The fragrance is a mild sweetness. Mango trees grow readily from seeds, especially if you take the seed from a very ripe fruit. The seed is not tolerant to freezing or drying. In South Asia, mangoes have been cultivated for thousands of years. The earliest evidence of mango cultivation outside Asia is from the 10th century CE when these fruits were grown in East Africa. Today, mango is cultivated in subtropical and tropical regions worldwide. The three major producers are India, China and Thailand, but India is not an important exporter of mango since almost all mango grown there is consumed domestically. Two other examples of major mango producing countries are Indonesia and Mexico. Since mangoes can’t handle frost, it is not a common tree in Europe except for certain especially warm regions. Málaga, a province located on the southern coast of Spain, is famous for its mangoes. In the mainland United States, mango is chiefly cultivated in southern Florida and in California’s Coachella Valley. If you want to grow mango outside the tropics, it can be a good idea to use a cultivar that has been grafted on to the rootstock of the Gomera-1mango cultivar. This cultivar was developed in Cuba and is comparatively resistant to cold. The keepers of mango orchards tend to grow several different cultivars to improve pollination. Mango fruit are traded on the international commodities market and it possible for large companies to protect themselves against future price increases. This allows them to better control their business. Retail investors can earn money by trading binary options based on mango certificates. These binary options can be traded using a number of different binary options brokers including IQ option. The Alphonso mango is one of the most in-demand mango cultivars, since it has a rich sweet taste, creamy pulp and low fiber content. The Tommy Atkins is a seedling of Haden that first fruited in Florida in 1940. Today, it is one of the dominating mangoes on the world market, partly due to its appealing appearance, its transportability and its long self life. The Turpentine mango tastes of turpentine. This tree is mostly grown for its rootstock, onto which more pleasantly tasting cultivars are grafted. Anderson produces large mangoes; the fruits can be 30-35 cm in length. Enormous amounts of Banganapalli mango is produced in India each year. The fruit is very juicy and slightly tangy, with a creamy texture and little or no fibre. Coconut Cream is a cultivar patented by Zills High Performance. The fruit tastes similar to coconut cream pie. The Raspuri is very popular in southern India. In tropical regions, Choc anan can produce two crops per year if conditions are favorable. Dwarf and semi-dwarf cultivars are available for ornamental growing in containers.